I have been on a mission to learn how to prepare perfectly cooked salmon at home. I must say, I used to be intimidated by cooking fish. But it could not be easier! 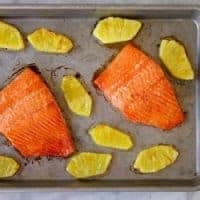 I’ve tried preparing salmon a number of different ways, and this sweet and spicy pineapple salmon is one of my favorites. I prefer salmon that has a slightly crispy crust. This salmon is cooked under the broiler to achieve just that, for a dinner that comes together in less than 30 minutes! My next goal is to perfect pan-frying salmon in ghee. I have dreams about my favorite salmon from one of our local restaurants that does just that. It seems like anything cooked in ghee automatically becomes the best thing ever. Sweet and Spicy Pineapple Salmon. 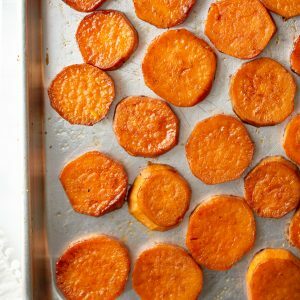 Broiled to perfection for a quick and delicious dinner! Mix together the ginger, lemon juice, soy sauce, and 1/4 cup maple syrup for the marinate. Pour over the salmon fillets in a shallow dish and let sit at room temperature for 15 minutes, turning half-way through. Preheat the broiler with the rack in the top position. Mix together the remaining maple syrup and cayenne pepper for the glaze. Remove the salmon the marinate and pat dry with paper towels. Season lightly with salt. Place the salmon fillets and pineapple slices on a rimmed baking sheet. Brush the salmon and pineapple with the glaze. Broil until the salmon is cooked through, 8-11 minutes, brushing the pineapple and salmon with more glaze halfway through. Serve the salmon topped with the pineapple and lime wedges if desired. Enjoy! If your salmon has skin on it, place it skin-side down on the baking sheet. The skin will come off nicely in one piece once it is cooked. I only eat wild Alaskan salmon. 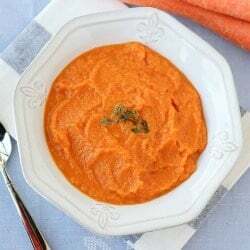 It is so healthy and flavorful. I love this spin on it with the pineapple. I just received a pineapple as a gift and will have to try it. Just made this for dinner tonight after getting home for work. It was quick and delicious! Just what I needed 🙂 Thanks for sharing! Erin, this really is the yummiest salmon! I've made it twice now and I LOVEIT!